While today there is a boom in herbs and Ayurvedic medicine treating illnesses this way is not new and, as you probably know, the tradition of using holistic methods to treat illness called Ayurvedic medicine has been used for centuries. Many of the herbs and spices used are ones that we commonly have in our kitchen cabinets today. These herbs, however, didn’t originate here and many travel to us from India. Some of these popular ancient Ayurvedic herbs include cinnamon, ginger, Gotu Kola, Boswellia, Gymnema, and East Indian Globe Thistle can now easily be found at your local grocery store or herbal medicine store. Ginger is a common Ingredient in many dishes but also has many medicinal uses. It is a great digestive aid and can also help with colic, gas and ease heartburn symptoms. In India it Is known as a Sunthi or Adrak and has been used as a tonic which can enhance your vigor as well as an antidepressant. One of the most common herbs In India, Gotu Kola, is a great herb for healing wounds and addressing skin disorders. It is sensitive in nature and can be used for insomnia and is also said to help lower blood pressure. Gymnema Sylvestre or Gumar is an herb you will probably be hearing a lot more about as it can help to block sugar. In fact, if you put this herb on your tongue you’ll notice that it did in the case of sweets. Some theorize that this may be able to help in weight loss as it may reduce a craving for sweets. Use of it in diabetics showed a decrease in blood sugar levels. You might use cinnamon in your baking but it’s also been used by Ayurvedic Herbalists for hundreds of years as a stimulant. It also works to sooth the toothache pain, makes a great astringent and can help with rheumatism. Cinnamon essential oil has an anti-fungal and antibacterial properties. Frankincense or Boswellia can be used as an anti-inflammatory and is also said to be a good expectorant as well as help boost the immune system. This is an important herb for centuries and as you recall, was presented by one of the three wise men. East India Globe thistle is not an herb you hear too much about but has been used as an Energizer for centuries it is also said to help reduce blood sugar. 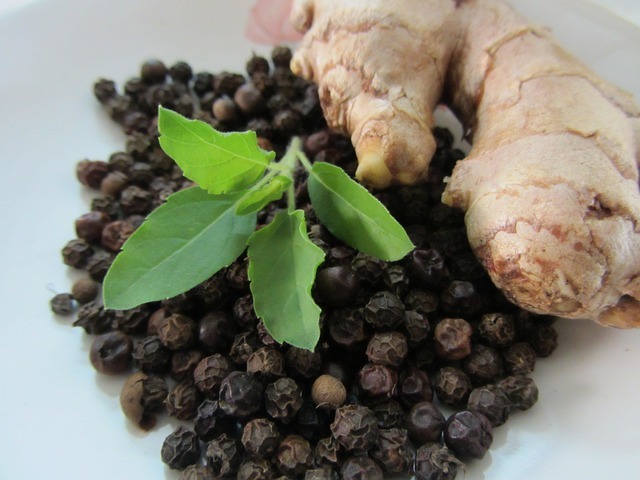 There are many other Ayurvedic herbs that have been used for medicinal purposes for centuries and that in our modern culture are regarded as simply spices to be put in food. It seems over the centuries we have lost our knowledge of the effects that the spices have on our body and how they can be used to treat ailments. Of course if you have a medical condition that you think one of these herbs might help you should consult your doctor so that he or she can review your current medications to see if there would be any adverse effects before you take any herbs. Just because herbs are natural doesn’t mean that they don’t have side effects and they can interact with your medicines in an adverse manner. Take ginseng for example – this herb thins the blood so if you are on blood thinners and you add ginseng to your diet you could end up making your blot too thin and it won’t clot which could become life threatening if you cut yourself. When in doubt, it’s best to consult a medical professional. Lee Dobbins writes for Herbs And Home Remedies where you can read more articles on herbs and natural remedies.